Earlier this year in a series of posts called “On Being A Cyborg“, I wrote about various technologies that enrich and assist us in living our lives. The defining quality of these technologies is that rather than pulling us away from the core human experience, I argued that they actually help make us more human. Today I’d like to add to this list. After watching Chris Milk’s TED2015 talk – How virtual reality can create the ultimate empathy machine – I believe that virtual reality technology could be a solution to getting us to care, specifically about the people living in realities so far removed from ours that they are hard to imagine. One such experiment in empathy machines is the interactive short film entitled Wilderness Downtown, a project with Arcade Fire that has an avatar running down a street, that you quickly realize is the one you grew up on. I actually used this little bit of virtual reality a few years back when he made it, and myself was delighted by the results. You can try this one using the link above. His next attempt was an art installation – The Treachery of Sanctuary. In this piece, people were given the power to transform themselves into birds and bring them into flight using triptych technology. …when you’re sitting there in her room, watching her, you’re not watching it through a television screen, you’re not watching it through a window, you’re sitting there with her. When you look down, you’re sitting on the same ground that she’s sitting on. And because of that, you feel her humanity in a deeper way. You empathize with her in a deeper way. Milk’s team is now making more of these films – currently shooting one in Liberia. And these films are now being shown to the people at the United Nations who can change the lives of those inside these virtual reality worlds. The power of this medium to enhance human empathy is incredible. I’ve spoken before about multimedia literacy and about the problem with our society’s primacy of text over other modes of communication. Milk’s work is demonstrative of the power of other mediums beyond text to communicate things such as empathy – something that can be communicated in a written story, but may be communicated better in a virtual reality world. It’s not a video game peripheral. It connects humans to other humans in a profound way that I’ve never seen before in any other form of media. And it can change people’s perception of each other.And that’s how I think virtual reality has the potential to actually change the world. So, it’s a machine, but through this machine we become more compassionate, we become more empathetic, and we become more connected.And ultimately, we become more human. I would love to view one of his virtual reality films. Wouldn’t you? I am currently attending the 2015 AERA (American Educational Research Association) conference in Chicago, and I have been attending and participating in a variety of exciting presentations, roundtables, and poster sessions about the many types of interesting research around education and its unique challenges. I am still making sense out of all I learned, and I hope to share some of the interesting talks with you in the next few weeks. Meanwhile, today I want to talk about this amazing playground I spotted here in downtown Chicago. Last week Elsa wrote about the importance of play in our ever-changing world, reminding us of the essential nature of play. Perhaps this was on my mind because during my free afternoon this weekend I was walking near Millennium Park and couldn’t help but stop to admire this incredible play space. Maggie Daley park is a $60 million, newly opened 20 acre recreational space, opened in 2014. It was designed by architect Michael Van Valkenburgh as “a counterpoint to the symmetry and formality of Grant Park… with.. curvilinear forms, dramatic topography, and many whimsical elements.” As described in this article, there is a 3-acre play garden designed in the spirit of “Alice in Wonderland” and “Charlie and the Chocolate Factory,” which is the piece of the park I stumbled upon . I was immediately enchanted by the surrealist, cartoon-like environment. Mayor Rahm Emanuel stated that the play garden “will allow kids to challenge themselves and do things they didn’t know they could do“. In a world where I worry about childhoods lived behind a screen and enacted through highly constrained, scripted environments, I am so excited by this notion of fostering unstructured play. The rich narrative and creative potential of places like this is endless, and I find myself envious of the young children who will be enjoying the play garden this spring. More pictures of this play space below. I will report back on my more academic experience at this conference next Monday! Children loved running up and down the rubbery foam hills, rather than using the stairs. A giant bridge connecting two towers. When I crossed, three young boys were working together to shake the bridge, excited at the prospect of making me fall (I remained upright, to their extreme disapointment). My colleague from Teachers College taking a turn on one of the slides. A web made of wires and ropes, where young boys created a clubhouse to call home. A few weeks ago I blogged about the empowering experience of storytelling. This got me thinking about the various types of skills and experiences we can provide to students that will enable them to have a stake in their own education but also prepare them for the 21st century. We’ve blogged about many of these skillsets before, such as multimodal literacy, play, and skepticism,. One such modern-day tool is coding. As Mitch Resnick explains in a 2012 Tedx talk entitled Let’s teach kids to code, he talks about Scratch, a kid-friendly programming software born out of MIT Media Lab’s Lifelong Kindergarten Group. Scratch is intended to cultivate fluency in technologies, to the level that students are able to express themselves creatively. I’ve participated in one Scratch day and a week-long summer logo workshop, where I’ve learned how wonderful this platform is. As Mitch suggests, it’s a fantastic platform for learning coding skills, but it also fosters curiosity, creativity, and student-centered learning. As kids are creating projects like this, they’re learning to code, but even more importantly, they’re coding to learn. Because as they learn to code, it enables them to learn many other things, opens up many new opportunities for learning. Again, it’s useful to make an analogy to reading and writing. When you learn to read and write, it opens up opportunities for you to learn so many other things. When you learn to read, you can then read to learn. And it’s the same thing with coding. If you learn to code, you can code to learn. Now some of the things you can learn are sort of obvious. You learn more about how computers work. But that’s just where it starts. When you learn to code, it opens up for you to learn many other things. With this in mind, I’ve become excited about the many recent initiatives to bring coding experiences to students. Not-for-profit companies such as ScriptEd_ equip underprivileged students with coding skills and internship experiences to bring about this fluency with technology. As explained in the video above, these coding opportunities are empowering. They open these students’ worlds to a lucrative job market as well as a whole new way to express themselves. Compare to reality, not to some imaginary standard of perfection. The truth was that even our least amazing prototype was miles ahead of the competition. It also happened to be the simplest concept, and the one that most tightly addressed the actual needs we’d heard from people we had interviewed and observed. Even if it didn’t fulfill our fantasies of perfection, we chose that option as the way forward, and we ended up nailing it: our award-winning design sold like hotcakes. Fifteen years later, it’s still in production, making people happy. This is a key insight which speaks to one of the core tenets of design thinking: that the solution be created from a point of deep empathy and understanding so that it truly serves the need of the target audience, not the ego of the designer. Some say that rooting your choices in reality is a sure path to mediocrity, but nothing could be further from the truth. Dedicating yourself to understanding what people really want — how they’ll experience a product in the real world — forces you to get away from your desk and make a tangible difference. Instead of just talking about a grand paradise of what might be, putting in the effort to understand people’s day-to-day lives, and then actually producing something that works, is what separates a true innovation from a merely good idea. Great innovators dream, but they are also relentless about comparing those dreams to the real world, and acting accordingly. Tom Wujec is a designer who specializes in visualization. In his new TED talk – Got a wicked problem? 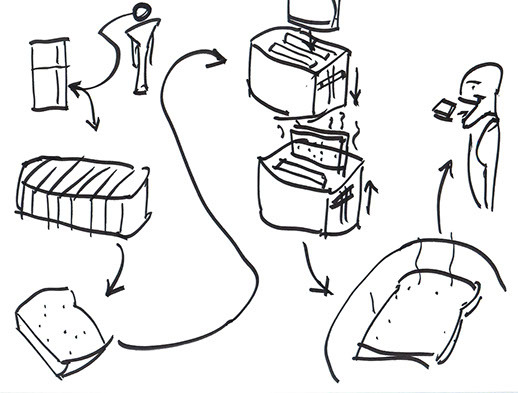 First, tell me how you make toast – he discusses the “design thinking way” of confronting a challenge: making your ideas visible, tangible, and consequential. How do you make toast…* ?? He explains his theory by starting off with a simple problem-solving exercise. 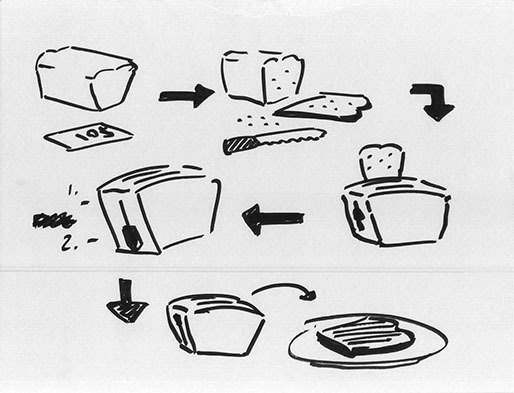 How do you make toast? 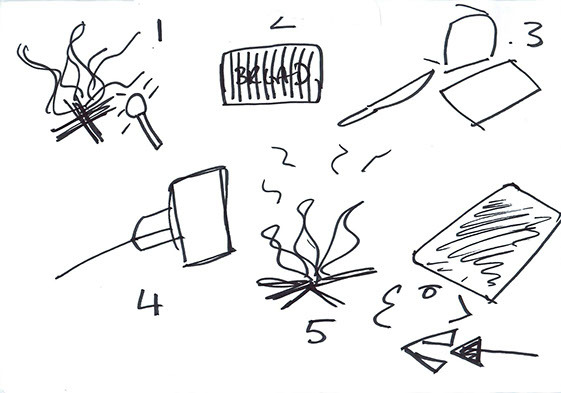 He has asked thousands of people and teams to draw their toast-making methods for him. While the drawings demonstrate differences in the processes and focus of the act, one thing they all have in common is their structure; almost all of the drawings have nodes, representing tangible objects, and links, forming the connections between them. These combinations create the systems models that make our mental models of “how something works” visible. You can measure the complexity of a mental model by the number of nodes, and Wujec has found that most have between 5 and 13 nodes to be visually effective. What these systems models illustrate is that we intuitively all know how to break down complex things into simple things. Interestingly, Wujec has found that variants of the draw toast exercise can create better outcomes. For instance providing movable cards or sticky notes leads to better systems. People tend to develop nodes and then rearrange them like lego blocks. The malleability of the nodes facilitates rapid iteration of expressing and reflecting. In essence, it’s the design process. Additionally, in a group, it gets REALLY messy for a while, but ultimately people build on each other ideas and the final model integrates a diversity of viewpoints, with branches and parallel patterns to represent different paths to the solution. Wujec states that he has been seeing a visual revolution in business – people are beginning to pick up on this trend and collaboratively draw out their challenges and problems. Through this process of iterative refinement of nodes and links, organizations find clarity. While the final models are important, the conversations around the models are important too. Wujec’s ideas have much in common with the design thinking process of Design Thinking for Educators (more about this in a blog post here), which places an emphasis on iteration, collaboration, and the power of the sticky note. However, the idea of creating a systems model for your problems is a new and useful one. It is easy to be overwhelmed when faced with a daunting challenge. Breaking it up into small manageable pieces, and using the “sticky note” method to keep these fluid and iterate on one’s ideas can result in surmountable steps to solutions. Wujec invites us to try this method with his website drawtoast.com and concludes, so the seemingly trivial design exercise of drawing toast helps us get clear, engaged and aligned. Willpower and self control are important skills. In Walter Mischel’s famous marshmallow experiment, he put hundred of 4-year olds in a room alone with a marshmallow, and promised them two marshmallows if they could just wait until he came back. Children varied on their self-control, and when Mischel’s team followed up with the children through high school, he found that children who delayed gratification or exhibited greater willpower got along better with peers and had higher SAT scores. Those who eat their marshmallow immediately had behavioral problems and did poorly in school. While the results of this study are controversial (perhaps a post for another week), their are definitive links between wellbeing and willpower. Moreover, it is a skill you can cultivate, and there are a variety of strategies one can use to increase self-control. In the marshmallow study, the most successful participants used ways to remove the temptation such as turning around, covering their eyes, or putting the marshmallow on the far corner of the table, out of reach. Which brings me to this week’s installment of On being a cyborg. There exist a variety of great technological tools that can help us with self-control. Some of these directly concern our safety such as 1) GPS systems that refuse to let you enter an address when the car is moving, 2) in-car breathalyzers to curb drunk driving, or 3) Apps that utilize GPS and Airplane mode to prevent you from texting while driving (when your phone is moving at greater than 10mph). Others simply prevent us from making decisions we might regret later. College students might use Don’t Dial! – an iphone app to temporarily block phone numbers from your contacts. If you are one of those people who just can’t help but go back for seconds (and thirds, and fourths) of a batch of freshly baked cookies, a new technology tool Kitchen Safe can lock various items inside itself for a specified time. It can also be used to lock up phones during dinnertime or video game controllers when you should be getting your homework done. Perhaps the most relevant apps are ones that can facilitate focus for studying or learning, boosting productivity. SelfControl is an app that blocks distracting websites for a set period of time. If you have a paper to write, block Facebook, Twitter, and Instagram for the next 5 hours to prevent yourself from falling down a Facebook rabbit hole for an hour and a half. Other apps such as FocusWriter, Anti-Social, and StayFocused have similar functions – helping eliminate distractions so that you can work productively. For those of us who glue ourselves to a task for hours on end until we lose perspective on the big picture – Time Out allows you to set intervals where to break for 5-10 minutes to relax and take a step back from your work. While I love the idea of offloading some of the stress of maintaining willpower, I do worry that relying on technology for self-control can backfire if that technology is not readily available. Can the use of these help us to develop habits that will transfer to other contexts? For the example of placing phones in a Kitchen Safe during dinner, I could see the potential to get used to not having a phone at dinner and therefore developing a habit of not looking at one’s phone at the table. I have not yet seen studies on whether or not these types of technology help us to develop long-lasting habits, or if our willpower simply is gone when the tech is removed. Additionally, to cultivate willpower, we should ensure that we are teaching children to use these apps themselves, rather than enforcing them. A 13 year old self-regulating her study time with the aid of an app is very different from a 13 year old who’s study time is regulated by her parents’ enforcement of an app. Do you use any sorts of technology to aid you with self-control?